ReHouse diverts quality reusable antique, vintage and modern building materials from the landfill. We accomplish this by salvaging architectural items and offering them for sale at the ReHouse store. Our salvage crew works on-site at houses that are going to be torn down or remodeled. 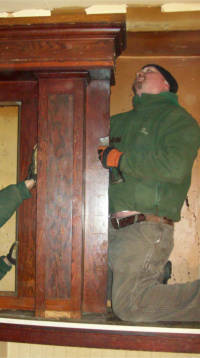 They carefully remove reusable items such as doors, cabinets, and lighting fixtures. The salvaged items are then loaded on a truck and hauled to the ReHouse store where we offer them for sale. Do You Have Items to Salvage? We are always looking for sources of salvaged items. If you know of a house demolition or major remodeling project coming up, please contact us. If you have a door, kitchen cabinet, lighting fixture, or any other used “house part” that is too good to throw out, contact us. All items must be in good reusable condition. Please do not bring items that are damaged, mildewed, extremely soiled, requiring assembly or incomplete or missing parts. We can not accept: paint, chemicals, loose glass, open bag’s of cement, mortar and the like. ReHouse reserves the right to refuse any materials. We recommend that you contact us by phone or e-mail with photos before bringing materials to the store. We accept quality salvaged items at the store during business hours or will pick up items of sufficient value from your home or work site. Salvage projects and item pick-ups are currently limited to the greater Rochester area. There are several ways that ReHouse can compensate people in exchange for salvaged items or the salvage rights to a property scheduled for demolition. Many people give salvaged items to ReHouse simply because they want to have the items reused and to achieve the associated environmental benefits. Store Credit - ReHouse may provide credit toward the purchase of products from our store in exchange for salvaged items that are in good reusable condition and are in demand. Tax Receipt - We accept charitable donations of architectural salvage items to our partners: Salmon Children's Foundation and Vietnam Veterans of America. ReHouse handles the sale of these items for the non-profit organization. Cash Payment - ReHouse may purchase architectural salvage items in select cases where the items have significant value and/or are in significant demand.